Check out these 6 live tips now! You can even catch them the next time you fly Air Canada. Navitas Naturals featured Judy and her Pomegranate Blast recipe on their Navitas Naturals Facebook page. Metabolism. Kick it up a notch! - Written by Insiya Rasiwala-Finn with contributions by Judy. - In Asia Spa magazine. - In the Tri-City News on October 1, 2009. Cultivating Kitchen Garden Projects for Youth! 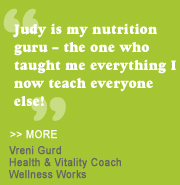 Judy is currently working with this non-profit as a registered natural nutritionist and specialty chef!